Kristina's collection of bloggy things. 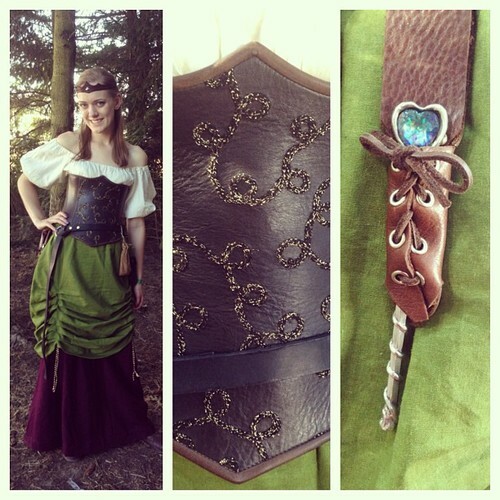 Look #2: Medieval Faire Maiden! As promised, I’m going to break down this year’s Renaissance costume, explaining the different pieces, where they came from, and what they mean. I’ve been attending Faires since mid high school, and the beauty of assembling a costume like this is that over the years, you can add a bit here or alter a bit there – and after awhile you’ve really built something unique and wonderful. The idea of putting together a costume in one year is daunting and expensive, but you can easily put together starter pieces and then add on each time you visit another event. This is my costume! I will start at the bottom and work my way up. So, on the bottom I have two complimentary skirts, both handmade. At the Faire these will run you about $50-70 each piece, but mine were handmade by myself, Liz and a friend a few nights before the Faire for more like $30, total. The bottom is a simple floor length purple skirt (Liz and I learned to hem this ourselves!) and the top is a neutral green skirt with three cinched sections to add texture and an interesting visual pattern to the design. Oh, and you can’t see this, but for shoes I am wearing basic brown boots. Next is my leather bodice. This is the one expensive piece of my costume, and I obtained it at the Faire last year from an extremely talented leather merchant. The bodice cost me $129, but as the central piece of this costume, it was a pretty worthwhile purchase. You can’t see this in the photo but the bodice laces in the back with a long leather cord and holds everything in nicely. The sparkly patterning on the front was what really sold me. Next is my simple leather belt, a necessity for any Renaissance costume. These generally cost anywhere from $30-50. From this belt hangs all of my “flair” – again, you can’t really see, but I have a leather satchel, a coin purse, a frog to hold a mug, a potion bottle, a magic wand, and a magnifying glass. In the back, not pictured, is a furry raccoon tail. Moving up, I have a simple off-white undershirt made for me years ago by my friend Liz’s mom. This is another staple of any Ren Faire costume – whether you use the blouse length style or a chamise, poofy sleeves are a must. And finally, the newest addition to my costume is the leather headpiece/tiara. I’ve spent many years looking for the perfect hat or head adornment, as I look terrible in both hats and snoods, but this year I finally found it. Sure it might have cost me $40, but for a piece I know I’l wear year after year, I’ll take it. Have you ever been to a Ren Faire? Do you dress up? If so, what’s your favorite costume piece? 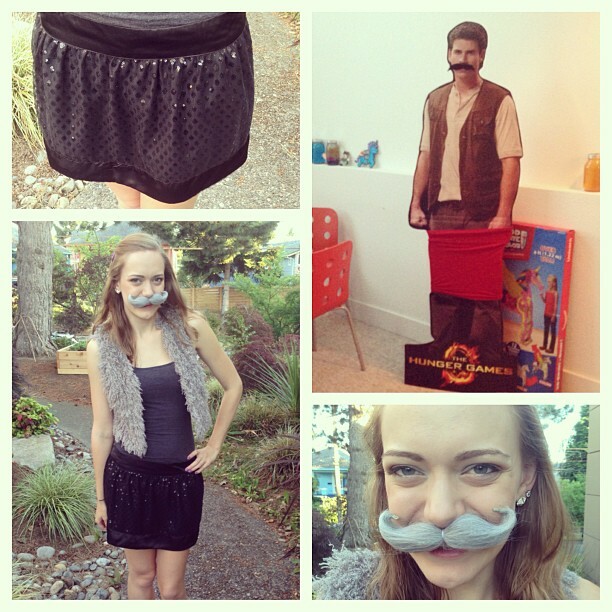 Look #1: Mustaches & Miniskirts! Hello, and welcome to my first “Look” post! I’ll be posting “Outfit of the Day” entries anytime I wear something particularly fancy, when I’m at important events, or when I go to costume or themed parties. This first post falls into that third category. Last night, my friends and I had a “mustaches and miniskirts” party as a sort of going-away soiree for our friend Kayley. Both mustaches and miniskirts were required of everyone in attendance. We had a bit of a tough time convincing one of the boys to don his miniskirt, but most people were pretty on board with the whole idea. Especially Gale. We couldn’t get him to take his off (though this may have had something to do with the fact that his stand is much wider than the skirt in question)! Anyway, the mustache was obtained for free at the LeakyCon mustache world record event, the skirt was a thrift store find and the vest is Forever 21. What’s the craziest themed party you’ve ever been to? Random musings, event wrap ups, outfit of the day, product reviews, articles, blog posts, etc. Video: Things I’m Into: July!